Much has been written about Wurster, who was raised in Stockton and educated at UC Berkeley. In 1922, a year-long European sojourn took him away from California, broadening his cultural and architectural perspectives. Upon his return in 1923, Wurster in joined New York’s Delano and Holmes, a firm that today would be labeled “high-end” residential. Wurster’s stay in New York was short-lived, and a year later he returned to California and opened a practice in Berkeley. 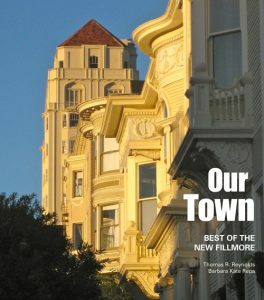 Several key commissions followed for well-connected members of Bay Area social circles. A number of projects adjacent to the Pasatiempo County Club, a highly publicized project near Santa Cruz, furthered Wurster’s emerging reputation and afforded him the opportunity to work with Church. These early projects are bookended by the famous Gregory Farmhouse in Scott’s Valley (1927) and the Clark House (1937), which appears to rise out of the sand on an Aptos beach. The home at 2600 Pacific is set back from the street and wrapped around a front garden. In 1936, Mortimer Fleishhacker Jr. hired Wurster to design a house at 2600 Pacific Avenue, on the northwest corner of Pacific and Pierce. Fleishhacker, a manufacturer of household chemicals as well as a lumber and coal man, had grown up down the street at 2418 Pacific. He also spent many of his formative years at the family’s Woodside country estate, Green Gables (1911), designed by noted architect brothers Greene and Greene. Wurster had completed a house for Fleishhacker’s sister and her husband, Eleanor and Leon Sloss, on the Green Gables property in 1930. The house Wurster designed at 2600 Pacific is an L-shaped, two-story, whitewashed brick dwelling. Set back from the street and wrapped around a front garden, the house is enclosed with alternating brick walls and high hedges. By bringing the garden forward on the lot, Wurster captured extra space for the house and garage, which are nestled into the hill, and also took advantage of the sunny southern exposure. 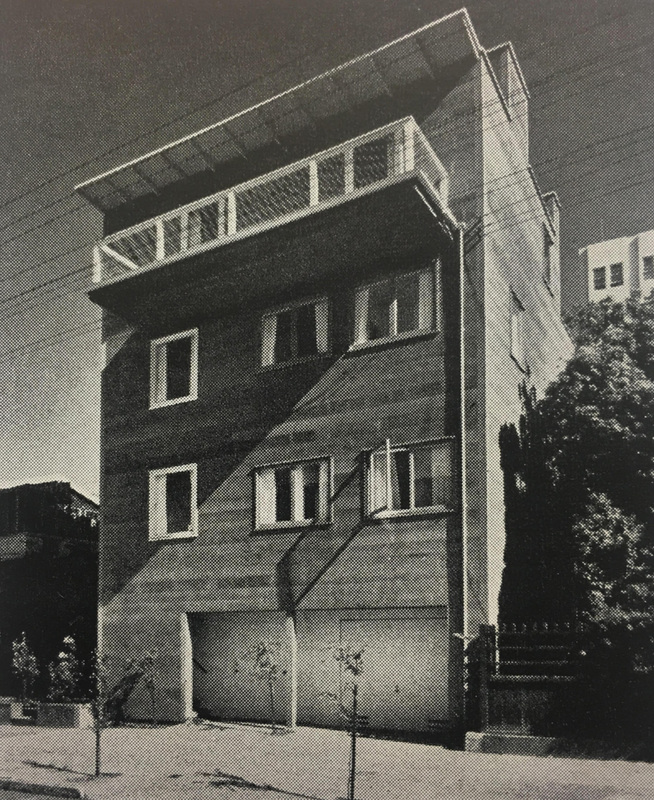 Wurster designed a corner home for Frank and Martha Gerbode at 2560 Divisadero. In 1939, Wurster secured two more important residential commissions in the neighborhood. The first was an elegant corner home for Frank and Martha Gerbode at 2560 Divisadero Street, at Broadway, just two blocks from the Fleishhacker residence. For this project, Wurster inverted the L-shaped plan so that the garden was behind the house. The terraced outdoor space framed distant city and bay views. The garden incorporated a remnant stone wall from the elaborate mansion of A.D. Moore that once occupied a large portion of the block. Wurster placed the entry right at the corner with a dramatic hall and circular stair along the north elevation and a rounded bay and a large second story window lighting the hall and stair. While thoroughly Modern, the use of red brick created a more traditional exterior appearance. The Gerbodes and the Wursters — including Wurster’s wife Catherine Bauer, a housing advocate — became lifelong friends. Frank Gerbode was a well-known cardiologist. Martha Gerbode established the Wallace Alexander Gerbode Foundation, named in honor of their young son, who died in a car accident. She recalled that during the 1945 United Nations conference, the Soviet consulate was located across the street. The Gerbodes housed two men from the U. S. Office of Strategic Services in a large basement room so that they could “keep an eye on” the Russians. At 2666 Broadway, Wurster put the garage and a small apartment at the front. Also in 1939, Wurster designed a house for Chace and Esther Grover at 2666 Broadway, diagonally across the street from the Gerbodes’ house. Adjacent to Normandie Terrace, which had remained undeveloped until the mid-1930s, the Grover house occupies a small, mid-block, 25-foot-wide lot. 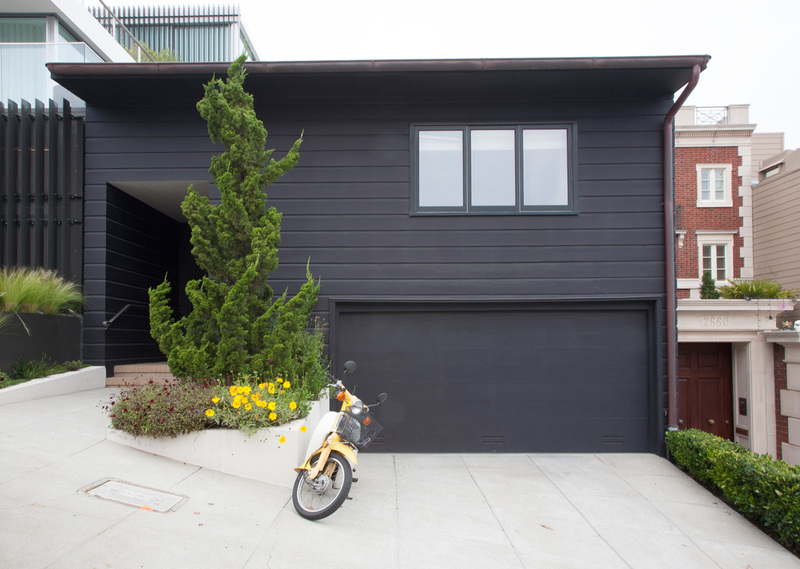 By placing the garage and a small apartment at the lot front, Wurster took advantage of the slope to build a narrow, stacked, three-story main residence at the rear of the parcel. A Thomas Church garden, with a kidney-shaped lawn, separates the two structures, accessible through an entry at the west front of the garage. While an article in the July 1943 issue of Architectural Forum commented that the facade was bland, the critic noted that behind it was a house of hidden charms. 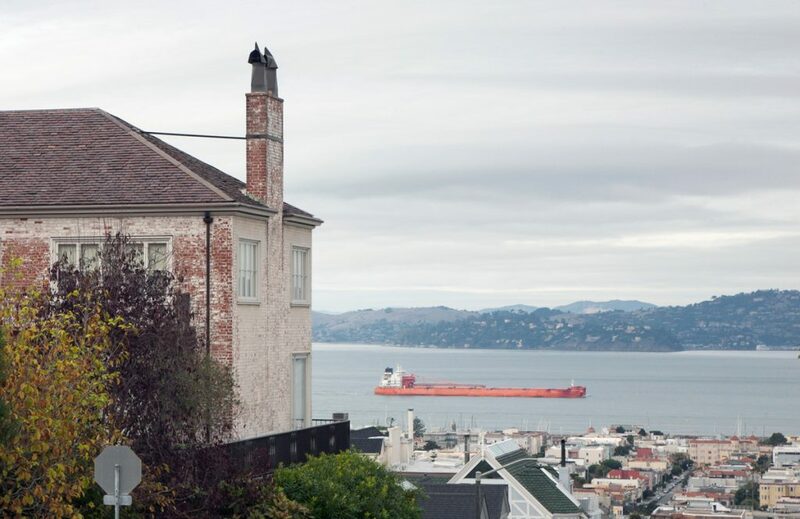 This was surely a reference to the curved interior stairway leading to the spectacular third floor living room space, with a deck and solarium affording monumental bay views. Chace Grover hailed from a Santa Cruz lumbering family and had a hand in developing Pasatiempo in Santa Cruz County in the late 1920s, so he was linked to Wurster both through his neighbors and his Pasatiempo contacts. The Grovers subsequently had Wurster design a country house for them in Woodside in 1950. The Stevens House, at 1641 Green Street, was still unpainted in 1941. A fourth of Wurster’s homes in the neighborhood was built for Harley and Georgina Stevens, at 1641 Green between Gough and Franklin. This house, dramatically vertical in its orientation, sits at the lot front and rises three stories, capped by a wide overhanging eave and a third story view balcony. The Stevens project, on a deep lot, also included a rear garden by Thomas Church, with brick pathways and another kidney-shaped lawn, this time centered with a large tree. Featured in the October 1941 edition of California Arts and Architecture, the simplicity of the exterior 10-inch flush wood boards — originally treated with bleaching oil, but now painted — was complemented by an interior of warm wood finishes. Wurster’s details at this home also included a dog house placed in Church’s garden. For the world’s finest mountains, God’s Country, I swear! The world’s finest friends, the best trout in the stream. Flow gently, King’s River, disturb not my dream. From 1939 to 1941 — about the same time he designed these family homes — Wurster also built two small cottages for sisters Alice and Marian Burr on a sloping block of Gough Street, between Green and Vallejo. The sisters were the granddaughters of an early San Francisco mayor, Ephraim W. Burr. The cottages are around the corner from 1772 Vallejo, the house in which the Burr sisters were raised. That Victorian-era, Second Empire Italianate mansion is a far cry from the small Modern pair of cottages in which the sisters invested in 1939. They engaged Wurster to build side-by-side residences along Gough Street, perhaps with the intention of eventually moving into the smaller dwellings. However, they remained in the family home throughout their lifetimes; the two Modern gems were rented, changing hands only after the sisters died, in 1966 and 1968. Wurster built two small cottages for sisters Alice and Marian Burr on Gough Street. The Burr sisters were the daughters of Edmund and Anna Burr, for whom the Victorian-era house at 1772 Vallejo Street was built. Edmund’s father, former mayor Ephraim Burr, was a major landholder in Cow Hollow and Pacific Heights; he built the Vallejo Street home as a wedding present for Edmund and his wife, Anna, who raised three daughters there: Elsie, born in 1877; Marian, born in 1884; and Alice, born in 1888. Elsie married writer and sociologist Harry Overstreet and raised three boys, one of whom became a successful gynecologist, inventing the Overstreet forceps. Elsie later divorced Overstreet, and eventually settled in Berkeley; her two younger sisters never married. Alice Burr, a budding photographer, is credited with a series of photographs of soldiers marching down Van Ness Avenue before they embarked to Manila during the Spanish-American war. These images — which she took in the spring of 1898 when she was only 10 years old — are now in the collection of the California Historical Society. The backgrounds of those photos record the remarkable residential properties that lined Van Ness before they were destroyed in the 1906 earthquake and fire. Alice became a successful artist and photographer, eventually building a separate studio behind the Burr mansion that faced Green Street. This little studio, designed for Alice in 1916 by Henry Higby Gutterson, the architect of the Storybook castle complex nearby at 1729 Vallejo, sits beside Wurster’s house for Harley and Georgiana Stevens, which was completed in 1941. Alice and Marian Burr were the cousins of the Allyne sisters, who lived a block away in their family home until the early 1960s. Allyne Park sits on the lot once occupied by their grand home, which was on par with the elaborate Burr home. By 1963, both of the Allyne sisters had died and a bit of controversy arose about what to do with their home before it was eventually demolished to create today’s park. 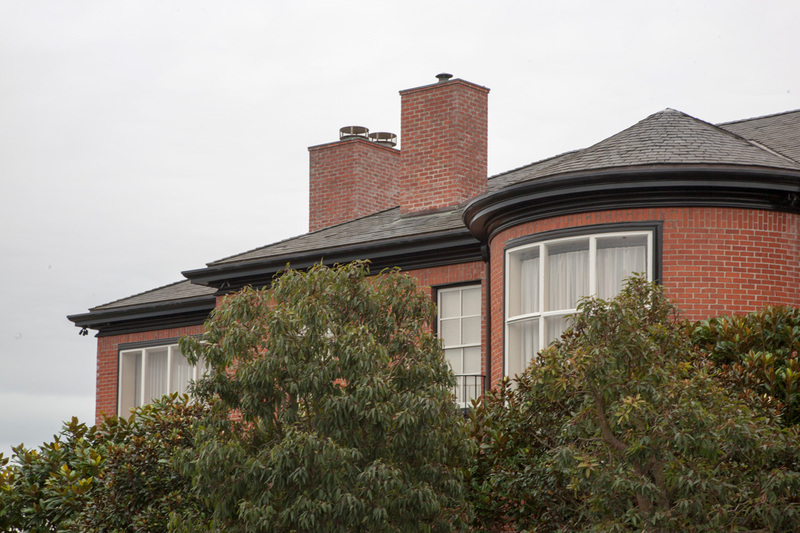 However, in 1969, Alice Burr’s estate successfully secured a landmark designation for the Burr mansion on Vallejo, which became Landmark #31 and still stands. 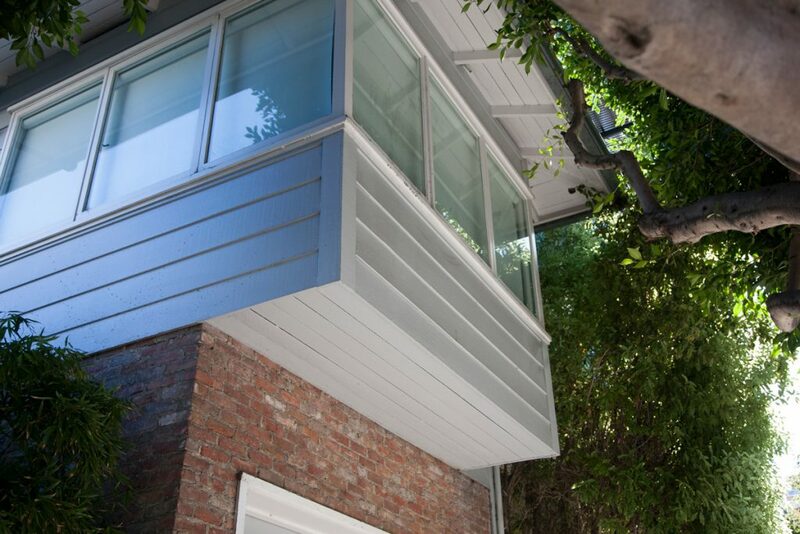 The cottage at 2514 Gough projects out over the brick retaining wall in treehouse fashion. 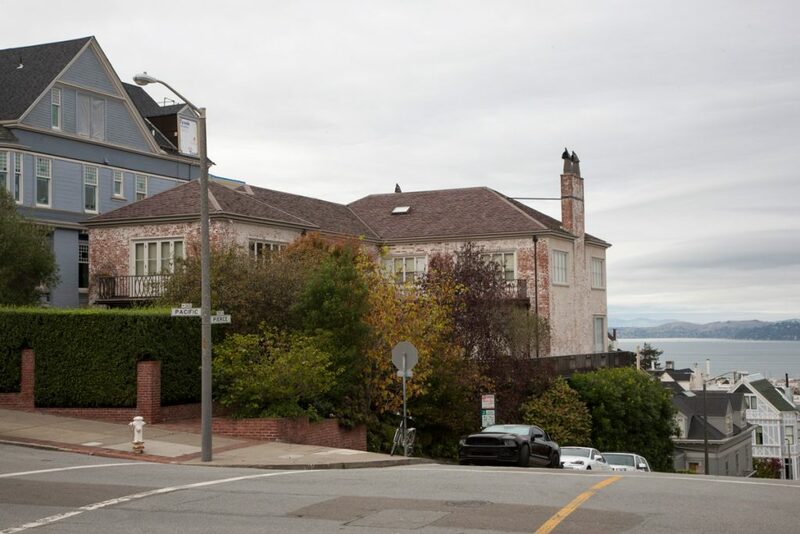 While efforts were ongoing to save the Burr mansion from the fate of the Allyne house, the two Burr cottages Wurster designed were sold to new owners in the early 1970s: Thomas C. Stapleton and Levin A. Sledge. The homes have subsequently changed hands a few additional times. The adjacent dwellings, each accessed by a set of stairs, march up the Gough Street slope. The northernmost, 2516 Gough, is downhill from the other cottage at 2514 Gough. 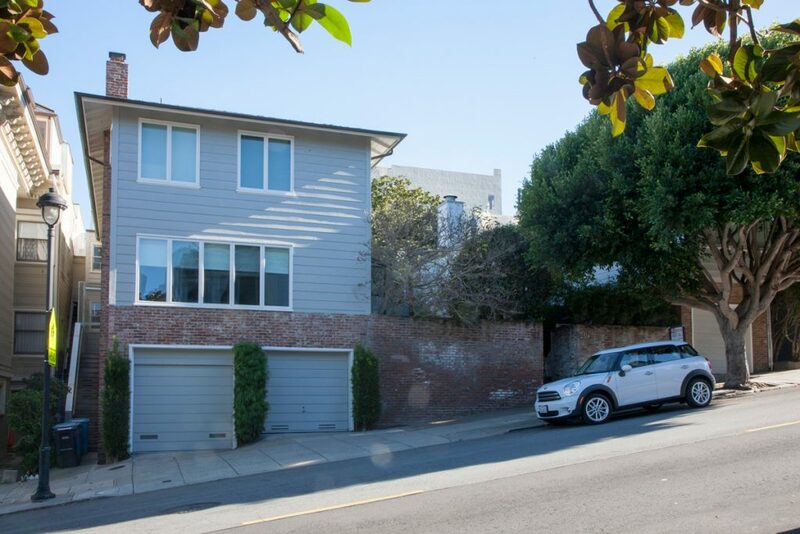 Wurster set this two-unit dwelling on top of the brick retaining wall, punctuated by the garage doors. There is a front and rear unit, each accessed via an outdoor, brick-paved walkway. The front two-story unit has a ribbon of windows at the first level, paired with windows of the same proportion above. An overhanging hipped roof along Gough caps the front facade, punctuated by a brick chimney along the north elevation. The cottage at 2514 projects out over the brick retaining wall in treehouse fashion. The glazed room created by the overhang is capped with the same hipped roof used on the downhill partner. This simple grouping of dwellings epitomizes Wurster’s design philosophy and incorporates his typical assemblage of wood, brick and glass. When World War II began, Wurster’s practice took a different turn. 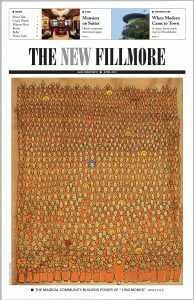 All of the homes he built in the neighborhood set the tone for subsequent commissions undertaken both on his own and with partners Theodore Bernardi and Donn Emmons. Wurster’s residential work culminated with the dramatic Big Sur Baer House of 1963, by which time he had been diagnosed with Parkinson’s disease. 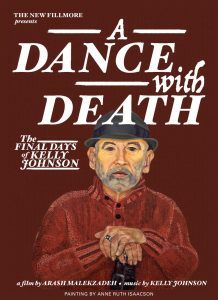 He died a decade later, after unparalleled contributions to both the profession and architectural education. Wurster’s other innovation, founding the U.C. Berkeley College of Environmental Design, brought the disciplines of architecture, landscape architecture and urban planning into one college, a first for an American university.